Do you know what silence sounds like? It might seem like a stupid question, but until I travelled to the Yukon, I’d never experienced true, uninterrupted silence. It was one of the most startling things I noticed while I was there. Life in London is noisy at the best of times, so for me, silence is when no one is talking, no music is playing and I can’t hear any sirens. Those moments might feel serene, but there’s always a buzz of background noise: planes stuck in holding patterns above my apartment, wind carrying the sound of a train pulling into a nearby station, the steady whoosh of cars traversing the busy street I live on. I’d never realised what I’d been missing until I stood on the edge of Tagish Lake, an hour and a half from Whitehorse, watching the sunrise and straining my ears to detect noise. Any noise. But there wasn’t so much as a rustle. The silence was so loud my ears began to ring, and I realised that I had discovered true wilderness here in the Yukon’s Southern Lakes region. As the name suggests, this area of the Yukon is south of Whitehorse, close to where the border meets British Columbia. 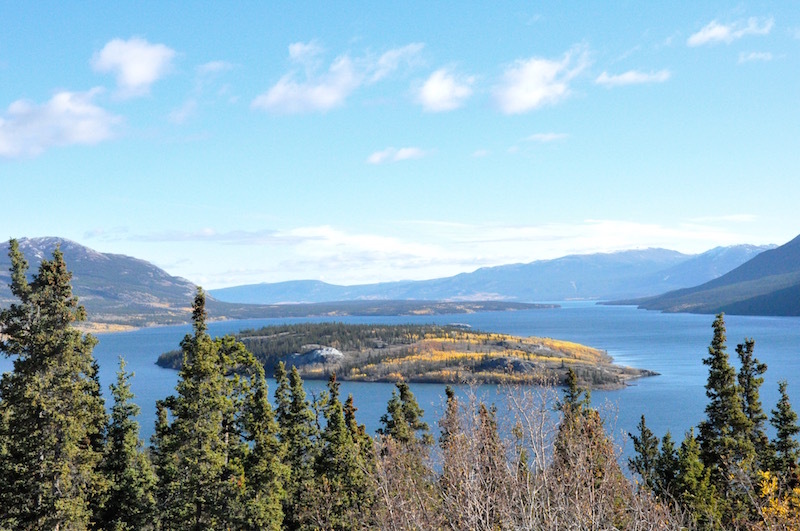 The lakes that give the region its name are actually the headwaters of the Yukon River, and back in the gold rush, when those seeking fortune came from far and wide to Dawson City, they had to navigate across these waters to reach their destination. There are six communities in the district, one of which is Carcross, which was visited by the Duke and Duchess of Cambridge on their 2016 Canada Royal Visit. Another community is Tagish, which is home to around just over 200 people. I met a lady who lives in Tagish, and she patiently explained to an open-mouthed me that although she has wifi at home, she has no running water and collects what she needs from a community well instead. 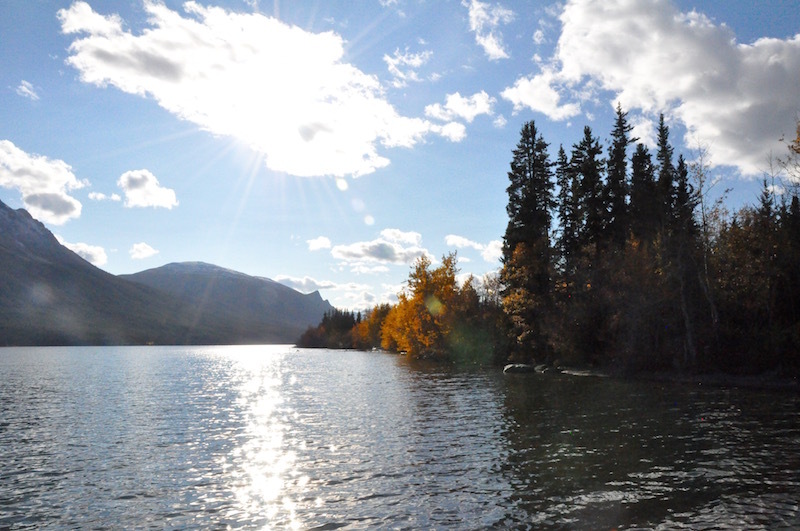 I could barely believe it – but she assured me that life in Tagish is wonderful, and truly silent. My first night in the area was spent at Southern Lakes Resort, a new restaurant and resort right on the shores of Tagish Lake. Owners Sarah and Gebhard live across the lake at the sister resort, Tagish Wilderness Lodge, which can only be reached by boat, seaplane or, in the middle of winter when the lake is frozen, dogsled. Southern Lakes Resort can be reached by road, and it’s an oasis of understated luxury in the middle of the Yukon’s pristine wilderness. At the main lodge you can eat delicious meals created by Chef Bruno while enjoying world-class service and admiring the glassy-smooth lake, and in the evening you can retreat to your private wooden cabin, which is graced with the same incredible view. The cabins are simple but elegant, with a roaring fire, comfy bed and modern bathroom. The real feature is the small living area that faces the huge pane of glass, perfect for northern lights spotting and sunrise watching. It was from here that I watched as the northern lights come out to play, and after viewing the display from my little front porch, then from the living area, I lay in bed and watched them dancing outside the window. It was a magical experience. The next morning I sat on my porch drinking in the silence, wondering whether I’d ever heard anything like it before. In summer, guests at Southern Lakes Resort can canoe, hike, fish or take day trips to the nearby communities, and in winter there’s snowshoeing, snowmobiling and dogsledding to keep everyone entertained. Rates start at just CAD 220, which is a total bargain for anyone looking for a remote getaway (without the camping). I can’t sing the praises of this place loudly enough. Another gem in the Southern Lakes district, Inn on the Lake has been running for years and has earned itself a reputation for being one of the best spots to stay in the region. And it’s easy to see why. The Inn has a European chalet feel to it, with communal dining and living areas, an honesty bar and a laid-back vibe from the moment you arrive. There are a number of different room options, from private cottages to simple and comfortable rooms inside the main lodge. I was lucky enough to sleep in the jacuzzi room, which had the added bonus of north-facing windows, perfect for northern lights viewing. All guests have access to the outdoor hot tub and sauna as well as bike, fishing gear, kayak and snowshoe rental (depending on the season). In winter, the Inn provides cold-weather gear for guests to walk out onto the lake to try ice fishing, or simply relax by a fire to look out for a display of the northern lights. They offer all sorts of packages in summer and winter that include many once-in-a-lifetime experiences. Check them out here. One of the highlights of a stay at Inn on the Lake is the dining experience. Chef Troy works with local farmers to create a delicious farm-to-table menu for guests each evening. Dinner is a communal affair, with more food than anyone can manage (but we all gave it our best shot), and it’s a great chance to meet fellow travellers and swap Yukon stories. Our meal featured my favourite: Sockeye salmon, a local specialty that was cooked to perfection. Troy customised the menu for a couple of guests who couldn’t eat fish, and worked around my gluten intolerance which made for an even better meal. The warmth and hospitality of the staff at Inn on the Lake makes your stay feel incredibly luxurious, and although I wasn’t lucky enough to see the northern lights on my night here, it was nonetheless an unforgettable experience, and one that I highly recommend. Thanks to Destination Canada and Travel Yukon for inviting me along to hear true silence for the first time! This place should be prescribed for anyone’s who is stressed or worked up – seriously looks like the most tranquil, beautiful place. I had never heard of Yukon until about a year ago but I can almost feel how fresh the air is just from looking at these images!